The Orwells do what they do best, except a little better, on their new full length. The Orwells are the result of the two forces of American coastal punk and alt-rock metamorphosing in an angry and bored group of Midwestern teen musicians. Pulling from a broad range of guitar driven influences, the Illinoisans started making music early and released their debut, Remember When, before they had even graduated high school. Following their Atlantic Records debut Disgraceland, and their infamous David Letterman Late Night performance, they became somewhat well known as the punky kids that make snobbish and infective garage rock songs. That may sound familiar but is ultimately forgivable for a band who has claimed to be nothing more than what they are and also released a politically charged hit single (“Who Needs You”) before even reaching legal drinking age. Three years following their contained breakout, the now-seasoned-veteran 20-somethings return with Terrible Human Beings, their second album on their current label. The album may stray at times from their formulaic approach but certainly not often or too far. Described aptly by the band as “mutilated pop songs”, this collection of 13 songs is filled with straightforward songwriting construction that is assaulted with loud reverberating guitar bends and crashes and unquestionably catchy hooks. Apt examples of this can be found just about anywhere on the record, but especially with the lead track and single, “They Put a Body in the Bayou”. 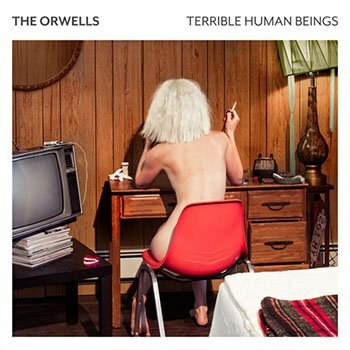 A song about as catchy as rock singles get, it contains lyrics muddled with ill-mannered distrust of authority and a guitar solo sparsely strewn with nihilistic notes that indeed achieve the sound the Orwells are striving for. And while it will be refreshing for returning fans to know that those addictive hooks are still aplenty, skeptics wary of the young punks’ abilities will be pleased to hear that the group has elevated their songwriting ambition. The lifestyle critiques of “Creatures” and “Hippie Soldier” are brash and loaded with an often humorous sense of self-aware hypocrisy. Also present are the frenetic and blazing tracks “Buddy” and “Fry”, the bouncy chord changes, self-depreciating lyrics and screaming guitar bends on “Heavy Head”, and some infectious choruses that certainly meet all the traditional requirements for a punk album. Unfortunately, that’s most of what this album has to offer. Although the Orwells do venture outside of indie punk templates on a few occasions, it’s not enough to make any significant shift or statement on the genre. “The Body Reprise” is a thumping, spaced-out jam with echoing guitars and disorienting voices swirling in the background, and “Double Feature” is the only song to venture outside of three minutes, and does so by a long mark, clocking in at 7:18. It features extended instrumental sections and a steady bass that drives the song into an explosive release and ultra satisfying crescendo that makes for an excellent finale. These make for a few hints at innovation and mark a positive direction for the band, but they ultimately left me wanting more of what I didn’t get. That being said, you certainly get the best of what’s advertised with Terrible Human Beings: a tasteful (or perhaps distasteful) blend of the Buzzcocks, Killers, Pixies or any various punky indie band of the last handful of decades. While the vocal performances may err, like their previous record, on the monotonous side, and the construction may be formulaic, they certainly make for a talent to watch. Offering a kind of pessimistic energy that may not add much to a genre inundated with bad attitudes, they elevate their game a little here and produce a record stuffed with likable and applicable anthems.